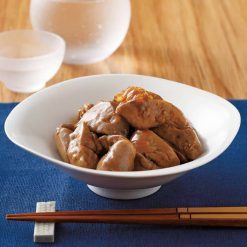 Healthy, easy to prepare domestic Soft Boiled Chicken Liver, with light aroma and smooth texture. Made using the livers of chickens raised in the open nature of Kagoshima Prefecture, without the use of chemicals or antibiotics. Eliminates the need to perform time-consuming preparations yourself, such as draining blood. This domestically produced Soft Boiled Chicken Liver was prepared in a way that gives it a smooth texture, without the dry and tastelessness that result from liver being heated up too long or at too high a temperature. It is nutritious and can be used in a wide variety of recipes. In addition to a light aroma and smooth texture, chicken liver is a known nutritional powerhouse. It is rich in heme iron, a type of iron that is absorbed by the human body at a notably high rate. It’s no wonder that it’s often recommended as a measure to prevent anemia. Chicken liver contains blood and oils that have a pungent aroma once oxidized. 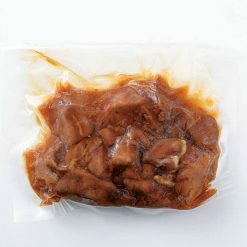 The chicken liver used in this product is heat-treated the following day after it is processed, resulting in less of this particular scent. Please boil each individual bag of our Soft Boiled Chicken Liver for approximately 3 minutes, using a pot filled with a generous amount of water. Please be careful, as there are cases where the bag touches the edge of a hot pot, etc., leading to the bag melting and a hole being made.The product is extremely hot after being heated, so we ask that you please be careful to not burn yourself.A delicious take on “nirareba” (liver sauteed with leek) can be made by combining this product with garlic buds (product 1040) (scheduled to be sold starting in September), and sesame oil. This recipe is included with the product.It’s also an excellent item to base your recipe on the next time you host or attend a Chinese food night.Note: There are cases where part of the chicken liver appears darker. This coloring is a natural part of the raw ingredients, and appears after it is heated. There is no problem with the product itself. This product contains chicken liver (Kagoshima Prefecture), soy sauce, fructose and glucose syrup, sugar, ginger, mirin, reduced sugar syrup, rice starch, salt, yeast extract, (includes raw wheat). This product is not suitable for anyone with allergies to wheat, soy or chicken. Origin of ingredients: chicken liver (Kagoshima Prefecture). Prepared and packaged in Japan.